Real customer reviews from real surfers. "Dave, I gotta froth over the Turbo Ripper for a minute. It's been so fun these last three days, and I'm really feeling the FocusFlex loading up and powering through turns. That double concave makes it so easy to get on rail. It gets into waves early and is definitely the fastest board I've surfed. I let a buddy try it yesterday and it almost went flying out from under him...he definitely wasn't ready for that acceleration! I'm really happy we brought the width in to 19.5" but kept the [same standard 6'0] volume. I'm gonna be happy about that come wetsuit time, and I think this thing will be great in the barrel if these winds would ever swing offshore. The board flies... I made a lot of sections I shouldn't have. It feels like a video game when you unlock a new board and it ups your stats. Probably my favorite out of the boards I've owned. You've got skills man. I'm never buying off the rack again! Thanks! 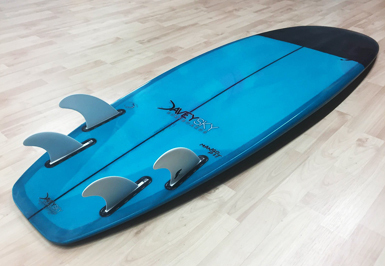 Oh and I'm totally digging this [DaveySKY signature] traction pad dude!" "The Coconut rips dude! I snuck into a tube during Friday's dawn patrol...couldn't be more stoked and I haven't even tried it as a quad yet because I'm having so much fun with the single fin. The Coconut definitely stands out in the lineup and it's great to get off the standard thruster for a change up. "I recently had a 3 week work trip to Hawaii and knew I would have some time off and got a chance to put my FocusFlex Bombshell and FocusFlex Jet into some pumping north shore surf. First: the Bombshell at Pipeline was off the hook. Riding a 6'2 in 6 to 10 foot pipe - and a few at Backdoor - was a little sketchy at first but I was able to hold my own. Next: was extremely impressed with my FocusFlex Jet. Surfed it at Haliewa and other north shore breaks...the handled everything could throw at. the best was laying it on rail and feeling it flex in the sweet spot - not to far forward and not to far back. 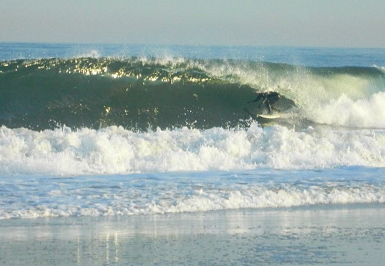 I was coming out of hard cutbacks with enough speed to immediately go and hit the lip. 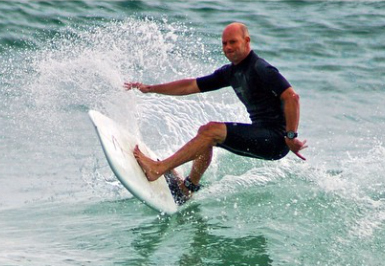 Dave, you are on to one of the best advances in surfboard manufacturing." "This was my daily driver in Indo. Handled pretty much everything up to about a foot overhead. This board was plenty fast and super nimble and allowed me to make it around sections on the crumbly days. 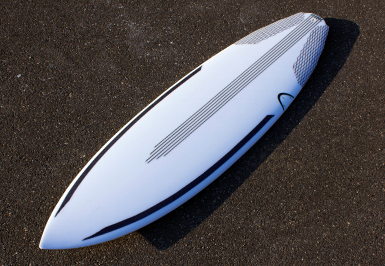 Perfect high performance shortboard for the trip." "I LOVED THIS BOARD!!! Even though it never got bigger than about 8 feet, there was a lot of water moving around in Indo. There were a few days when there was a decent swell in the water, but it was crumbly, and I needed just a bit more paddle power as the waves didn't stand up. The Love rocker with the slightly increased volume over my turbo Ripper was just the ticket to catch the big open ocean swells and enjoy some nice glide ins!!! I can't tell you how glad I am that we decided to shape this board up because if I didn't have it with me, I would have struggled on several of the larger days. This board will be in the bag on every trip I take!!!" 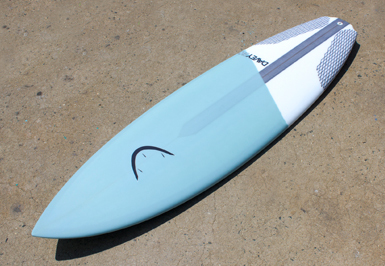 "I have surfed MANY different shapers boards and I can finally say the search is over! Dave shaped an incredible 6'0" Jet for me and I could not be happier. I am a bigger guy and when the waves are small it can be a rough day in the water but not now. Everyday is a fun day with this board! The best part is that if its overhead it still has integrity on the performance side. I can wait to pick up a board in FocusFlex tech. Customer for life. All other boards are inferior. Thanks again Dave!" "Just out of the water from my first session on the Mango Pit!!! Dave, I rode more waves to the shore today in 2 hours than I have in 3 years of attempting to surf! I had almost given up all together because of how frustrated I was...I'm more excited now to get back in the water tomorrow morning than I was my first few times surfing. All thanks to you! Props Dave, props! No one should ever buy a board that wasn't made for them specifically! 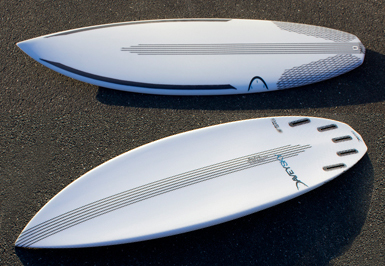 And more specifically made by DaveySKY Surfboards." "This has been the board man! I can't quite figure out what it is - but I surf soooooooo much better on this thing. It took me a few sessions to lock into it. But it was right around father's day - we had a couple solid clean days. Once I got that thing moving down the line - it was unreal. It has been really responsive - and stable as hell. On backside turns where i would usually dig my rail in - this board holds up and really has been getting me through some turns I used to never make. I couldn't be happier. You have a sick talent man and I can't tell you how much I appreciate it." "Best boards I've ever owned. Extremely responsive and easy to paddle. The Pipe Dream handles the biggest drops New Jersey winters have to offer. It also makes wearing a 5 mil not so bad, making it easy to paddle through the fast currents and large chop. I have the five fin option which makes this board great for a variety of waves. The quad is great for the steep hollow winter days and the thruster set up works great on the big open face. 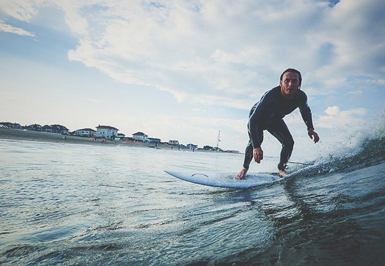 Dave is great to work with and will make sure you're riding the board that is best for you to guarantee you will get the best waves." "I couldn't have been any happier with the craftsmanship of the board. My first reaction, when I jumped in the ocean, was how well it paddled. I was amazed how easy I caught the first wave. Once on the wave, the Reviver was fast and turned easily. Two hours later all I could think about was how satisfied I was with the board. It exceeded all my expectations. The Reviver will definitely be my go to board from now on. I will definitely be reaching out to Dave for my future board needs. Thanks Dave!!!" "I wanted to check in and let you know that the board is unbelievable. It is everything I wanted in a board plus more. 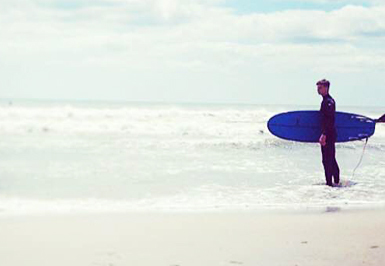 The board is fast as you promised even in today's small waves. I am impressed with how I can drop in late and the board rips down the line. Thanks for building me such an incredible board! Keep up the great work. I keep sending people your way." "I love my Mango Pit. Honestly just a perfect board for your everyday New Jersey wave. Got it in February and I haven't been able to get off of it! Davey's motto is "better" and this board describes it giving me better rides and making me a better surfer every time I get on it. Gives great fast smooth rides on even 2 foot mush. Also love that I was able to take it out on a bigger steeper day this past Monday! The variety of waves that this board can perform in really makes it my go to board every time I go surf. My first board from Dave but definitely wont be my last. Thanks a lot!" "I finally had a chance to ride the Turbo Ripper tonight, the board is insane! The board generates tremendous speed with little effort and maintains the speed from rail to rail. You were right about having to surf the wave differently with this board, when I wanted to pump I realized I had plenty of speed to hit the lip, throw the tail or whatever else I wanted to do. The board specs work perfectly, I am totally stoked with this board. At 40 years old, you expect your level of surfing to diminish, but ever since I started surfing your boards, I feel like my surfing is getting better and better. I can't thank you enough." "Thanks for the awesome surfboard. I love it. It's so easy to paddle and catches waves as easily as my 7'9". I don't know how you did that and don't even care: to me it's magic. The second day out on it felt natural, and I haven't ridden a short board in over a year. It's responsive, fast and flows so nicely. Not only that, but it looks awesome. I already want another board from you. My Coconut is just too much fun." "Took out the Mango Pit today [for the first time] in some 2 foot weak surf. Paddles like a beast and got into all the waves I wanted to...it was awesome!" A couple days later: "I was able to get out yesterday afternoon and the Mango Pit rocked again. 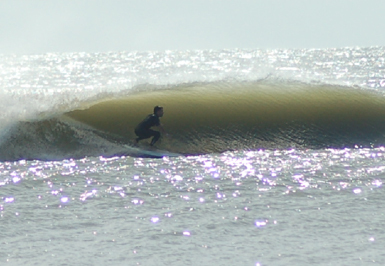 Got countless rides to the beach and a few nice turns - one of the best sessions all year. Just felt like I had to share the stoke! Cheers!" "First, let me say the construction and artwork is top notch. Catching waves was not an issue and it turned tight in very small areas. I was able to generate enough speed to make sections and even had enough float to get the reform when available. 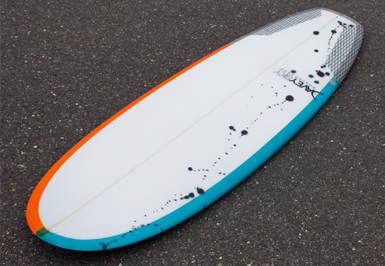 This board is excellent in soft surf. Here comes the surprise...as we received an increase in swell...the board held on drops and in tight covered positions without any challenge and I wound up surfing the MicroJet all week without touching another board. Overall, I am very pleased with the shape and performance of my new board. Thanks for all your efforts and care in building this on time without sacrificing quality." 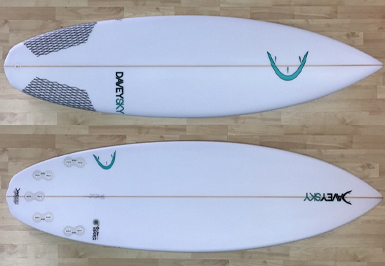 "As someone who does a great deal of research before buying something, I am extremely ecstatic about DaveySKY Surfboards. I was sick of ordering boards by major manufacturers that are designed for the West Coast and cost $700+ just to receive a [plain white] board that had imperfections from being rushed or soft glassing. My first board from DaveySky was to replace my Lost Rockup as an all around winter board. Dave very graciously and patiently met with me several times as I brought in the boards I was currently riding and explained what I did and did not like as well as how I see myself surfing. The result is a fully custom Pipe Dream model that I absolutely love. The glassing is strong, volume is perfect for me, and there are some subtle changes from the main design just to cater to my level. After such a great experience, I decided to go on the opposite end of the spectrum and ordered a custom Reviver model for the summer. The model looked so bulky to me at first, but Dave explained why it would work well with my style and how it would relate to past boards I had. I trusted his judgement since the Pipe Dream is amazing, and now I have a Reviver to make that summer slop super fun. If you are hesitant to get a DaveySKY, don't be. Call him up, visit the shop in Manasquan, and get a better board for less money than what you would pick up from any big name manufacturer." © DaveySKY Surfboards. All Rights Reserved.